It began as a personal diary in the summer of 2004. I was walking on Abureyhan Street. I looked at my hands, which always say more about me than my made-up face. My hands are plain and unadorned, just me, changing everyday. When I placed my hand on the copy machine and pushed the button under the surprised gaze of the store owner, I recorded myself on that day. I continued on the next day, and the next, everyday in early summer — the imprint of a warm summer dream. It was my first colorful dream in years, one that I thought I had lost…. The summer ended and a pleasant taste stuck to the back of my throat – with a bit of bitterness perhaps – the desire to duplicate infected objects in my home and personal things. I copied the hands or the belongings of people who had been around my house, the house on Abureyhan Street. In this precious, windowless house, which doubles my thirst for the sky, a sky which Abureyhan al-Biruni, the 9th century astronomer, had studied and wrote about so poetically, in the small geography that I try to know myself, the desire for registering the house pervades, the desire for recording myself – even in parody – this newly found self and the colorful world around it, and my hands. 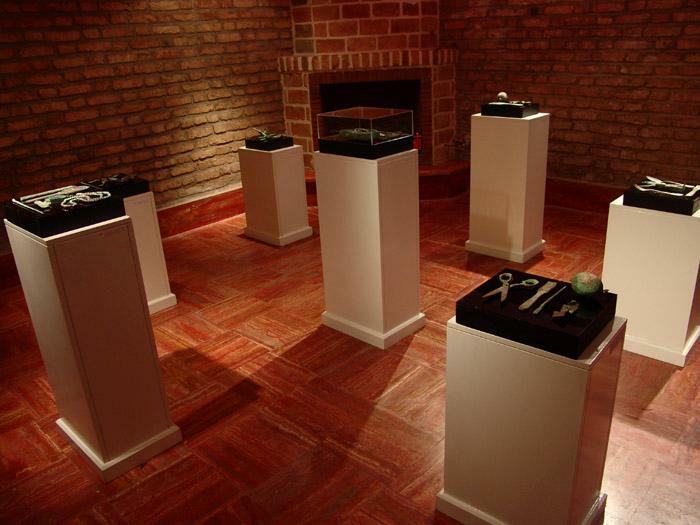 This collection was in three separate sections, which were shown in the winter of 2004 at Aria Art Gallery, on three levels. On the first level visitors could see paintings in a large and lit hallway. Seventeen works in big frames made up of the diary that I had created with the aid of the copying machine — colorful, the same way that others see me, made-up and happy, with jazz music in the background. One level down, I placed my sculptures. This was a small area with brick walls and dim light and music (a fusion of traditional songs and melodies of the Middle Ages}. The sculptures depicted the same elements and symbols which we had seen in the paintings, but this time in bronze and patina, set in boxes and on stands, the way we works in a museum, akin to objects pulled out of ancient tombs, from whose careful examination something could be said about their inhabitant. On the lowest level, a two-hour video was playing. For one hour in the morning and one in the evening I hung a camera around my neck and went around the house doing what I usually do: eat, drink, make phone calls, go to the bathroom and paint. At night , for a long time I sat in front of the Internet, chatting with on-line friends. A virtual party in the silence of a house. I invite my friends for this exhibition, which are mostly young men; simultaneously I search for the works of an artist in another windows, the works of Artemisia Gentileschi who had been hurt by and was hostile to men.